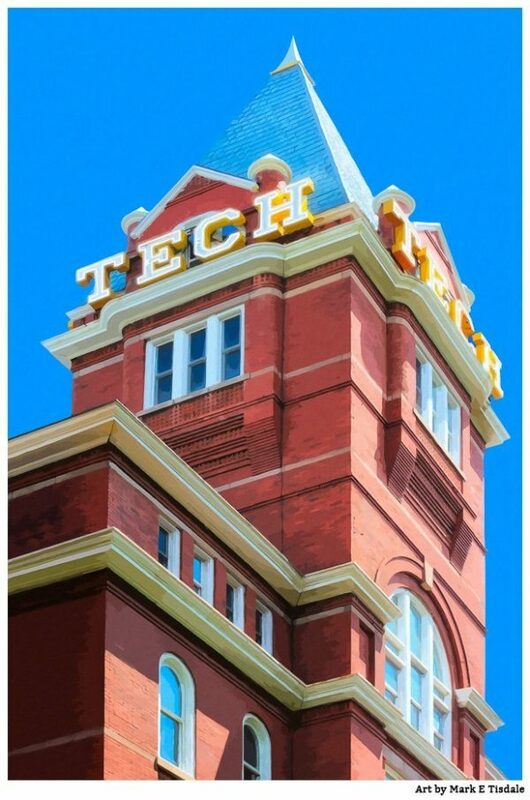 This Tech Tower print illustrates the heart of the historic Georgia Tech Campus. The Lettie Pate Whitehead Evans Administration Building is an original piece of the campus. It was completed in 1888, shortly after Georgia Tech was founded. The architecture of Tech Tower is a combination of Gothic revival which was very popular in the Victorian Era with hints of Romanesque style. The result is a truly classic college building, the type one usually sees on letterhead proclaiming college traditions. Tech Tower may not be the official brad, but it’s definitely part of traditions at Georgia Tech. For generations, stealing the T from the top of Tech Tower was a frequent prank. In recent years, there was concern over students risking life and limb and stealing the T now carries the risk of expulsion. That combined with an array of theft deterrent devices has greatly reduced the frequency of this particular Tech tradition. Nowadays the “T” is more often taken through selfies and graduation photos on the campus grounds in view of Tech Tower. This particular piece of art captures not only the T but the rest of the letters to as well as those great architectural lines of the old tower. I wanted to emphasize not only the architecture but the rich warm color of the bricks beneath cool blue Georgia skies. The result is a graphic modern take on a classic campus landmark. There’s a real sense of place for anyone who has visited the campus never mind those who are alumni of Georgia Tech. Does this print take you back to your own days at Georgia Tech? Or is Tech Tower still in your future? I would love to hear what brought you to this particular piece of historic Georgia Tech artwork. 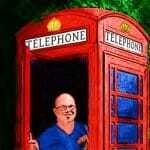 Do stop to share your thoughts and if you have questions, just ask!